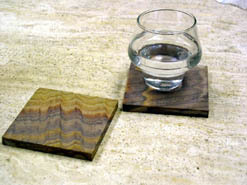 Beverage coasters made from natural sandstone are quickly becoming the most popular tabletop accessories on the market. Not only sandstone a natural, Mountain Born material, that retains a lot of the power and rustic beauty of the mountains from which it was quarried, but it also has the highly functional attribute of being absorbent. 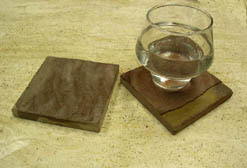 That means that when you place your wet glass down on one of these coasters, the moisture wont slip off the side or pool, in the center, instead it will soak directly into the stone, waiting within the pores of the coaster until it can be evaporated away. 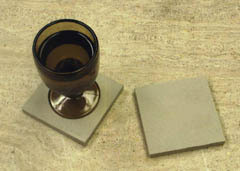 The panther sandstone is one of the most popular drink coaster materials that we offer. Not only does it have the extremely high absorbency of indian sandstone, but it is also an explosion of natural colors, with painted hues of brown and gold cascading across the surface of these gently sandy pieces. The surface of these attractive coasters is always different, with each one containing a unique representation of million year old, real, fossilized images, pictures from the distant past. Rainbow sandstone coasters are a truly unique creation of mother nature. Born in the belly of the Himalayan Mountains, chemicals and random elements all merge together over the course of centuries. Each elemental pieces of the stone adds its own colors and unique patterns are formed from the position of these constituent parts. The result is a natural stone which is vibrant, gorgeous, and unlike anything else in the world. Ruby red sandstone contains the passionate hues of love and lust, hate and war, all swirling naturally in a relatively subdued pattern, which can be seen right in the surface of each and every coaster sold in a set. A beautiful and functional home accessory, for any space where you want to add a little energy and fire. Looking into the face of moondyne sandstone is like losing yourself in the sifting sands of an exotic dessert landscape. The gentle texture, the subtle colors, and the powerfully soft beauty of these pieces, will make them a staple in any decorative task which you undertake. Cinnabar sandstone coasters are quarried in the southwestern United States, and within the chaotic surface of the stone, you can see a small piece of the spirit of America itself. Each line, every color, every unique feature found in the surface of these pieces is a result of natural formation deep beneath the surface of the earth, and is not influenced by art or skill of human hand in any way. Pictures form, deep beneath the earth. As chemicals and elements swirl and merge, chaos is slowly brought to order, encapsulated in the never changing eternal portrait of stone, that is unseen, unknown, lost in the darkness of the mountains core. Until one day, the light of dawn breaks through, penetrated with axe and saw, as human hand s rip the stone from its home, revealing it in new birth to the world of dawn. Hazy whispers follow random trails, colors emerge, and then fade, lost in the static information, that is the expression of this stones inner self. A natural beautiful work of the American earth, coupled with the functional attribute of absorption of moisture, makes these subtle pieces the perfect tabletop accessory. One of the great things about the natural American sandstone drink coasters, is that they have the same unpretentious spirit of the country itself. Strong, solid, an expression of earth, these stones are powerful and dominant pieces, that don't need bright colors or flashy patterns to ensure that they remain centerpieces of attention, wherever they are placed. Powerful bright white lightning bursts shatter the deep sea of green hues that makes up the surface of marbelized multicolors which layts gently upon the face of these exquisite sandstone coasters. A powerful union of the appearance of one stone, with the properties of the pother, almost like painting marble onto sandstone, to create a new kind of art, that combines properties and abilities from one type of material with the next. Looking through a sandstone window you see an ancient world. A city carved in stone, with intricate details worked directly, chisselled painstakingly, into the body of the earth itself. All of this is set upon a canvas that is stone itself, American quarried sandstone with a highly absorbent property. The result is that the image, with its shadows, its lines, and its contrasts, all pop out at you as if you could actually reach out into the coasters surface and feel them with your hands. 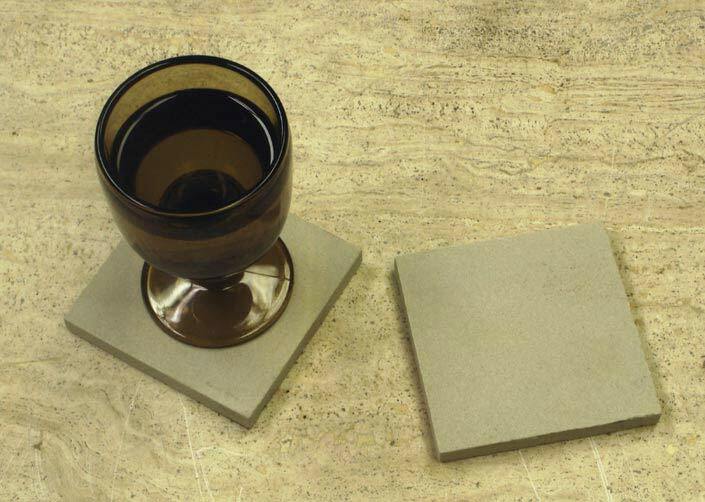 When you start to print on sandstone coasters, you combine the natural beauty of the stone itself, the functional qualities of sandstone, and the talent of human aren't, all in a single four inch piece. Here you see a delightful little tree frog, perched upon a leaf, just waiting for his chance to leap into the air, and catch his morning buggy snack. Cats, cats, cats, cats, cats, cats, cats. They're everywhere! they are staring at you. Do you have any milk? Do You want to pet them? everywhere you go they watch you, fuzzy little faces that need to be pet, eyes that say they don't. Cats are some of the most beloved creatures on this planet, and this portrait coaster is a tribute to the affection that you can't help but feel for the fickle feline species. Sandstone is aptly named, because it is comprised of elements very similar to sand itself, and it retains many of the properties of this material, such as colors and textures. The only difference is that sandstone has being formed under extreme pressure, which makes it a solid, powerful, and sturdy pieces. Here we see a sandstone coaster printed with a montage to its sandy origins, with an attractive beach scene printed delightfully on the surface of the piece. The rich textural surface of these honed sandstone coasters, is matched with the faded relief image of this old world map, depicting the two hemispheres of the globe. The result is a union of historically inspired art, with the natural beauty of the sandstone piece, to create a truly unique home accessory. Faded images hang in the distant recesses of your mind. That cafe in the dessert, its intricately carved door, the hazy shadows of a woman, what was her name? And of course, the palm tree, standing over all, its scant shade a taunting relief in the blistering heat of this ancient sun. A beautiful and naturally absorbent set of coasters, perfect for rustic or tropical home decorating. This is a rather simple set of beverage coasters, printed with just one geometric symbol, the swirling sun set in the center of the stone. Around this you find faded hues, merging with one another in luminous bulbs to create an intricate and yet subtle backdrop. All of this occurs upon the slightly grainy texture of its stone canvas. Classical Greek and Roman images come to mind when you gaze into the surface of these elegant coasters. The potted plant, an eternal symbol of domesticity, is coupled with a border done in the classic style, and then bordered again by the natural surface of the exposed sandstone. the result; a set of home accessories that unites nature and history in a truly unique way. The Fleur De Lis is an ancient symbol that has been recorded in the art and wall murals of ancient civilizations such as the Babylonians, the Egyptians, and even the ancient Japanese. While today it is often associated with the country of France, in actuality, this symbol of growth and fertility belongs to the entire world. The beauty of the earth was not enough. No, this artist had to take his own interpretation of stone, his own vision of the solid world, and re-imagine it, with colors even brighter and more pronounced than are found in reality. Then, to complete the effect, he had the image printed onto another piece of stone, to unite art and nature in a unique concept. 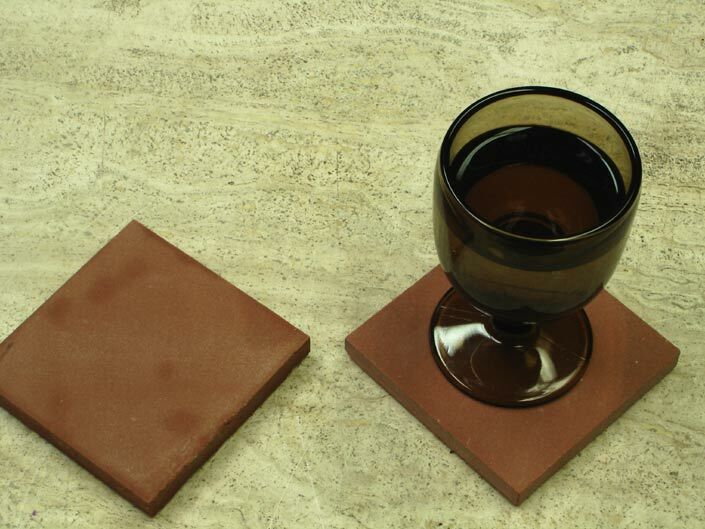 These stylish coasters have an ancient and mysterious quality, which is only enhanced by the eternal nature of the stone onto which the image is printed. Within the surface, light and contrast has been paired to create the illusion of depth. This is matched with the flat, but slightly graded surface of the stone itself, which retains the ability to absorb the moisture from your glass. Functional sandstone, naturally able to absorb the moisture from your glass, holding it within the surface of the stone until the water evaporates away into the air, like magic, leaving behind no mess and no damage. Now this wonderful natural property is paired with stunning visions of human art and beauty, creations which have sprung from mortal thought, only to be printed on the surface of these functional home accessories. These coasters represent a new innovation in design. 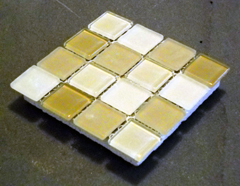 They merge the beauty of natural mosaic glass pieces, with the functional absorbency of sandstone, to create the ultimate coaster, a piece which is both impermeable and yet absorbent, polished and yet slip proof. 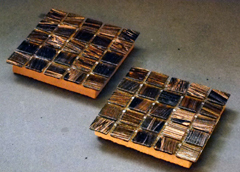 While the surface of these coasters is a field of unique and dramatic glass mosaic chips, beneath them lies a secret,. a sandstone base that can easily absorb any spills, drips, or drops which fall from the surface of a glass, holding the liquid moisture within the stone until it can be evaporated out into the air, dispersing harmlessly, leaving your surfaces completely undamaged. 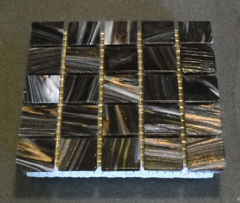 Powerful brooding hues of gray and storm cloud disperse in streaks across the surface of these glass coasters, broken by bolts of light which burst through the facade of the pieces, giving them dynamic tension which only serves to increase the powerful countenance of these coasters. And yet the real secret lies in the sandstone base which waits below, ready to catch the drips and drabs which funnel down to be held within the porous surface of the stone. 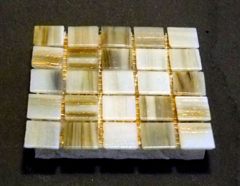 Yellow and white, contrasting gold and off tan hues, these are the points of interest which swerve across the surface of these enchanting glass coasters. And yet beneath their polished impermeable perfection, lies the sandstone underbelly, a piece of natural material that can easily absorb anything which slips past the mosaic face of the coasters. Brilliant shimmering perfection, a landscape of glass steps, each one leading to another world of light and color just waiting for your eye to explore its complex surface. And through it all, the clever canal style system of the mosaic placement allows liquid and moisture to seep down through to the surface of sandstone which acts as the base, and entrapping absorbent holder, for the liquids that pass through.